Back in 2013 I read an article about Dodge bringing back a special numbered edition of their Shaker package only available on the 2014 Challenger R/T. Having grown up around the muscle cars of the 60’s and 70’s, the article caught my interests immediately. And so the saga begins. In October 2013 I stopped into a local Dodge dealer to find out more information. Fortunately for me, they didn’t know much about this pending vehicle. The sales reps took a look at my current car, an 09 R/T Challenger, to determine its trade in value. I was completely taken by surprise at how much they were offering and went ahead with my plans to order the Shaker Edition. November went by, December went by and finally in January, the order banks opened for a very short time. My car was ordered exactly the way I wanted it. The dealership tried to order another a few days later but couldn’t. They did get several calls from other dealerships wanting to buy the car for quite a bit of a markup! I was able to check my vin number on Dodge’s website to see where in production my car was. It seemed to take forever to be built. 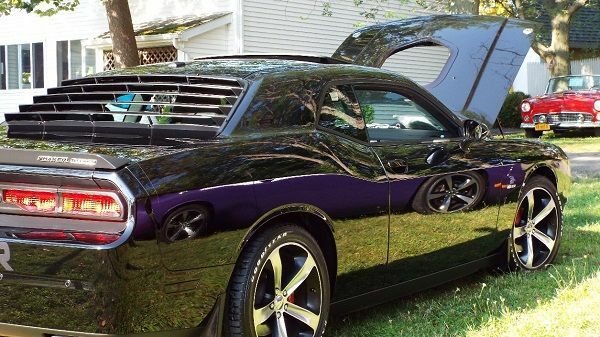 On a local challenger forum, I formed a group for “Those that ordered a 2014 Shaker” and people from all over the US and Canada logged on to share their stories and frustrations waiting. I kind of became the Ringleader…. We posted daily with any updates any of us had gotten, and as the cars started being delivered, I kept a detailed list of who got what, with what and what their “number” was. Dodge was only making 2000 for the US and 125 for Canada. The list grew and grew, and here I was, still waiting on production dates. During one of our frustration points I remember making the comment that we were all acting like a bunch of old ladies waiting to holler BINGO! After that, each person that got their car posted BINGO along with their car number. There were a few members on this forum that had access to info that we simple buyers did not. One person, nicknamed the Brampton Builder, watched for our vin numbers to come down the line and kept us informed when our cars were actually being built. I know that mine went to paint on Feb. 28th, sat for the weekend and was assembled on Monday, March 3rd. Another member named Wildman 3 kept us informed of the shipping info. After the cars were built at the Brampton Assemble Plant, they were shipped to Ground Effects in Windsor, Ont. CA to have the shaker package installed. A lot of the delay was at this point, not to mention a few really bad snow storms stopped the movement of the cars. I was able to find out the number of my car ahead of the others from a man directly at Chrysler. No one could figure out how I got this and they couldn’t. I didn’t want to betray my source so just simply said it was the little old Dodge guy I had locked up in a cage in my basement that only got bread and water if he gave me updates! Everybody was rolling with laughter! The car was supposed to be delivered to my dealer on April 9th. I happened to drive by there on the morning of the 8th and to my surprise, my car was sitting there! I knew it had arrived before my dealer did and I couldn’t wait to drive it home. My poor salesman Rich.. I really bugged him bad for a few months. Sorry Rich! It was my turn to holler BINGO! Shaker #0368 was home. When I got the car home, naturally I inspected it. To my surprise, all the build sheets from the assembly line were under the back seat along with the window sticker with my name on it. On top of that, I found three areas where a “BB” was written in white paint. Yes, the Brampton Builder initialed my car! What an awesome surprise. There was a meet & greet at the Brampton Assembly Plant shortly after that I drove up to join in. Another Shaker member, RTSB, from Texas, flew up to Buffalo on a Friday night, I picked him up at his hotel on Saturday so he could ride shotgun with me to meet some of the great people that built our cars. RTSB left to go back to Texas on Sunday and was asked to write an article as to the how’s and why’s he spent two days flying to a location he’s never been to, to meet some woman named Iamawild1, and let her take him out of the country to go to a car meet? We still laugh about this today! If I’ve learned anything, it’s that Dodge Challenger people are great people. We all share a love and passion for our cars, and love showing them off at car shows! Til u have a problem, then Chrysler turns it's back on you.